The partnership between The Territory of Play and schools was conducted through monthly videoconferences with themes organized by The Territory of Play team, meetings with guest speakers at Instituto Alana, and a research project about playing house conducted at each partner school. These activities were documented for a film that will be released in 2015 with the goal of sharing the reflexions and dialogues between the schools and The Territory of Play. 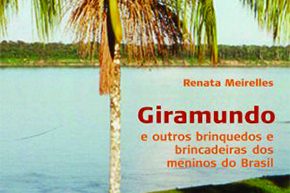 The focus of this book is on artisanal and outdoors games and toys, described and shown by the author through photographs and drawings of various ways of playing throughout Brazil. Resulting from years of research in various regions of Brazil, the author shows in this book that play does not depend on material resources, and toys can be built in a variety of ways throughout the country. The educator Renata Meirelles has researched toys and games in Brazil since 1994, and she shares what she has learned through videos, presentations, classes and workshops. She is the creator of the BIRA Project – Childhood Games of the Amazon Region, from which came the book Giramundo and other toys and games of the children of Brazil and The Territory of Play Project, developed in partnership with Instituto Alana, in which she spent two years on the road, from 2011 to 2013, with her husband David Reeks and their two sons documenting play in its various contexts in Brazil. 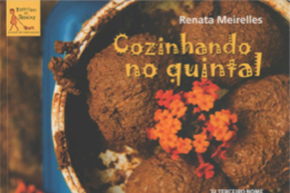 The book Cozinhando no Quintal (Cooking in the Backyard – Editora Terceiro Nome) was released in October of last year. 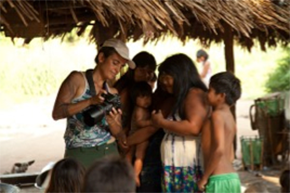 Written by the educator Renata Meirelles, creator of The Territory of Play project, the book was the product of the experience lived by Renata and documentarian David Reeks as they travelled through various regions of Brazil from April, 2012 to December, 2013 – they visited rural, indigenous, and maroon communities, staying in large cities, the deep interior, and the coast. An invitation to play, trade, and experience games, folk festivals, activities and knowledge of Brazilian childhood. From child to child. This is the goal of the new children’s television series from The Territory of Play Project. The series brings the magic, joy and potential of Brazilian children’s play to a young audience through a simple and poetic style, combining the documentary form with children’s narration and animated characters. The traveling exhibit was a journey around the geography of gestures that inhabit children’s games in various regions throughout Brazil. Gestures that tell stories, build a language of play, and present us to ourselves. 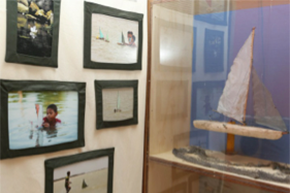 The exhibit was the outcome of The Territory of Play Project, presenting in 2014 a way of seeing the contemporary child through videos, photos, audio and toys. Our protagonist is the body at play, serving as a guide for looking, a guide that draws us to the actions of children. Beyond being an inventory of toys and games from various regions of Brazil, the exhibit was an attempt to bring us closer to those who play and how they play.